In My Mailbox is hosted by The Story Siren, and is a way for everyone to show their new books for the week. My lists will include purchased, gifted, received for review and won. This week I was able to stop by my favorite bookstore The Book Rack in Moline, IL. I love going there. I found some gems this week and was able to use up my credits! 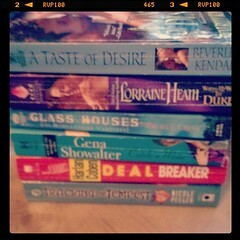 I don't know any of your books but I've heard great things about the Thea Harrison series. ENjoy them all! 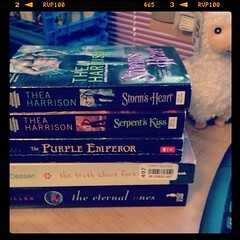 I've hear awesome things about Thea Harrison too and I can't wait to get the series started! It's pretty awesome. 🙂 They have a small YA section and but I almost always find a book I'm looking for. It's a small shop but they have a lot. I make my husband take me every time we're in the Cities. We don't have a bookshop in our town so it's always a special trip for me. You'll have to let me know if you like it! Enter your URL in the website field, then click here to leave a link to your posts below your comment!